A meme that was only partially true at the time it was created is still circulating three years later, when none of what it says is accurate. The claim about refugees was false in 2016, and it’s still false in 2019. The number of refugees that the U.S. takes in each year is capped by the president under the Refugee Act of 1980, so the number isn’t “undetermined.” In fiscal year 2016, the cap was set at 85,000. For fiscal year 2019, the cap is set at 30,000, which is the lowest it has been since 1980. The meme’s other claim about Social Security benefits is also false. When the meme was posted in 2016, there was no cost-of-living adjustment, or COLA, for Social Security recipients that year. Although, it wasn’t because the government didn’t have “enough” money to raise Social Security benefits, as the meme says. Instead, there was no COLA because the rate of inflation didn’t trigger an automatic increase. The COLA is determined by the increase in the Consumer Price Index for Urban Wage Earners and Clerical Workers, which is tabulated by the Bureau of Labor Statistics. There have been three years — 2010, 2011, and 2016 — when that index hasn’t yielded an automatic increase in Social Security benefits because there was a decline in the CPI-W. Since the Syrian civil war began in March 2011, the U.S. has accepted 21,334 Syrian refugees — but only 41 of them came to the Unites States last year, according to the State Department’s Refugee Processing Center. “Law Does Not Provide for a Social Security Cost-of-Living Adjustment for 2016.” Press release. Social Security Administration. 15 Oct 2015. “Cost-of-Living Adjustment.” Social Security Administration. July 2017. Cost-of-Living Adjustments since 1975. Social Security Administration. Accessed 9 Apr 2019. Cost-of-Living Adjustment (COLA) Information for 2019. Social Security Administration. Accessed 9 Apr 2019. Presidential Determination on Refugee Admissions for Fiscal Year 2016. No. 2015-14. 29 Sep 2015. Presidential Determination on Refugee Admissions for Fiscal Year 2019. No. 2019-01. 4 Oct 2018. “Refugee Admissions and Resettlement Policy.” Congressional Research Service. 18 Dec 2018. “Armed Conflict in Syria: Overview and U.S. Response.” Congressional Research Service. 25 Mar 2019. The Office of the United Nations High Commissioner for Refugees. Syria Regional Refugee Response. Accessed 11 Apr 2019. U.S. Department of State. Refugee arrivals, March 1, 2011 – April 11, 2019. 11 Apr 2019. U.S. Department of State. Refugee arrivals, Jan. 1, 2018 – Dec. 31, 2018. 11 Apr 2019. 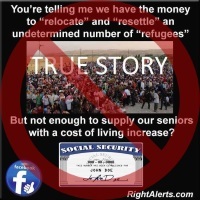 "...We have the money to 'relocate' and 'resettle' an undetermined number of 'refugees' … But not enough to supply our seniors with a cost of living increase?"